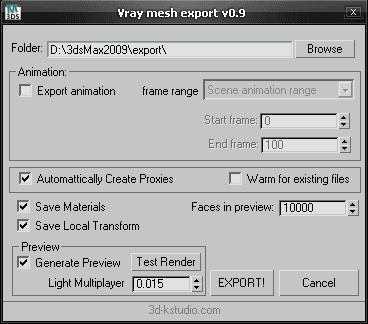 Export Mesh to VRayProxy with material. Adds capability for saving settings the utility. These scripts are included in the TrackScripts pack. Submitted by Bormax on Thu, 2015-10-22 14:56. Submitted by Kstudio on Thu, 2015-10-15 01:08. Please try the Project Manager. It support to Vray, Mental Ray, Corona, Maxwell,Thea and Final Render proxies. Submitted by Bormax on Wed, 2015-10-07 16:32. Submitted by Max_User666 on Sun, 2010-10-24 14:01. Submitted by Kstudio on Sun, 2010-10-24 10:40. You need add permission for write to folder "Scripts"
Right-Click on Folder and choose properties. Submitted by Max_User666 on Sat, 2010-10-23 11:32. Its says "Runtime error: filestream cannot create: -- destination folder --VRayMeshExport.ini"
Plz tell me how fix it. Submitted by Kstudio on Thu, 2010-03-25 08:06. Fixes issue with loading materials. Big thanks to Manuel Seger for bug-report.